Fungal Pharmacology is a comprehensive, up to date source of antifungal drug information online. We provide peer-reviewed, accurate and independent data on antifungal pharmacokinetics and therapeutic drug monitoring. Drug-drug interaction is available in a free tool and app. They contain clinically useful, reliable, up-to-date and evidence based insight into possible pharmacokinetic interactions between antifungal drugs and other prescription drugs, over the counter medicines and natural products. 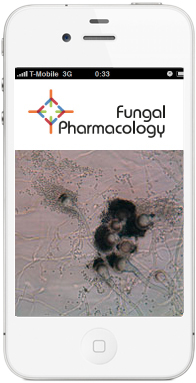 The app can be downloaded free of charge from Google Play or the App Store (search term Fungal Pharmacology). It is a great honor to present our initiative for the management of drug interactions in patients using antifungal drugs. Antifungal drugs have a high potential for drug–drug interactions. This is an ongoing concern in the treatment of fungal infections. Azoles are both substrate and inhibitors of various cytochrome P450 (CYP450) enzymes, with CYP3A4 being the major enzyme involved. The influence of azole antifungal drugs is not limited to CYP450 enzymes as membrane transporters, such as P-glycoprotein (P-gp), may also be affected. Other classes of antifungal drugs may be subject to drug interactions as well. Enzymatic inducers or inhibitors may influence the pharmacokinetics of echinocandines and (lipid formulations of) amphotericin B may have pharmacodynamic interactions on the level of renal toxicity. Inhibition or induction of both metabolizing enzymes and drug-transporters may alter the pharmacokinetic profile of the drugs involved and can affect both interacting members and, in most cases, must be avoided as this can lead to overdosing with the consequence of toxicity or underdosing with a loss of effectiveness. In general, it is almost impossible for the clinician to be aware of all interaction mechanisms and potential consequences for the individual patient. Not all interactions are clinically relevant, and a thorough understanding of the mechanisms of drug interaction provides the clinician with the ability to predict such interactions and to avoid those of greatest clinical significance. Now, we provide you with a software tool facilitating interaction checks specifically targeted on antifungal drugs and including a tailored advice on the management of these interactions. Using the app it is possible to perform this at the bedside of the patient. Basic pharmacokinetics for all antifungal drugs will be presented on the PK page. As well as the possibility to take advantage of our laboratory facilities for the purpose of therapeutic drug monitoring or pharmacokinetic research.